It is important to take steps to prevent freezing of sprinkler system heads in entryways, entry closets, owner’s closets, and lock off rooms that have been added as build out rooms. If there is a heater in the space, make sure it keeps the room at or above 50°F. Owners in the rental pool must rely upon DMR housekeeping to maintain the heater setting. The ultimate responsibility is still yours. If there is not a heat source in a closet or lock off room, there is an easy way to assure that some heat gets into the space. 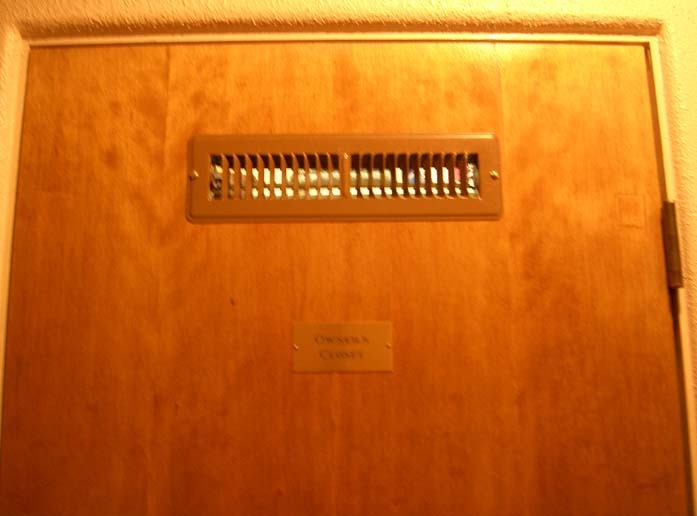 A 2” x 14” ordinary vent cover can be installed in a cutout in the door. There is always some space under the door to allow circulation of warm air into the closet or room, and cold air to exit. Don’t be a victim of a frozen sprinkler head – make sure you have heat in all your closets and lock off rooms.